Currently working on the proofs for Austral, with the usual feeling that I am bound to miss some trivial but really annoying error. That never goes away. 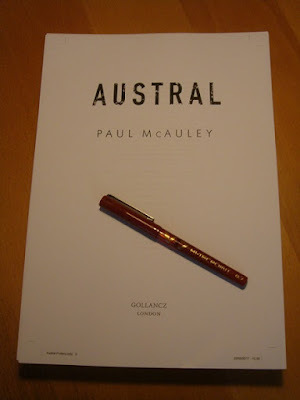 And have just finished the penultimate draft of a short story, the first in a year or so. It took a while, mostly because I tried to work out the consequences of a confluence of ideas about climate change, artificial life, a closed community, so on, without a clear understanding of the pivotal character. It wasn't until I began to get her right - to see how she saw her world - that the narrative began to acquire its own logic. It still needs work, but at least it now has a real, rather than a forced, ending. Headbanging against a stubborn narrative that refuses to crack open? That never goes away either.